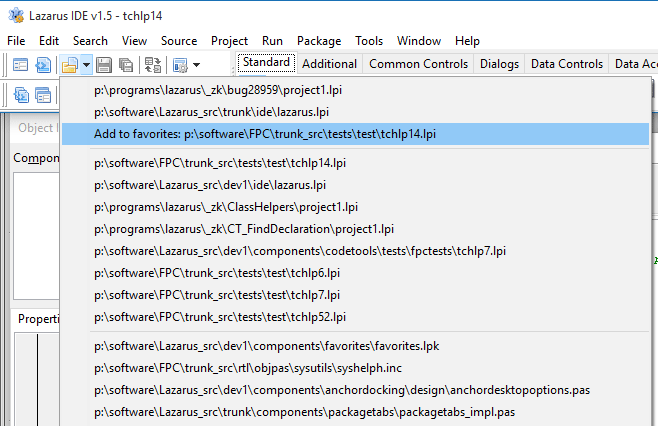 The package is available since Lazarus 1.5. Go to Package > Install/Uninstall Packages. Search in Available for installation for favorites. Save and rebuild IDE. The IDE will ask for confirmation, then it build the package, links it in and restarts itself. When installed, this package creates a third section (on the top) in the Open tool button drop-down menu where you can register your favorite projects. This page was last modified on 20 January 2016, at 19:34.